DOUBLE PLUS Chain is a new type that meets low noise requirements and high safety standards. It was invented in Japan in the 1980s, and it is now being used around the world for electronics assembly lines as well as in the auto parts, beverage, and medical equipment industries. 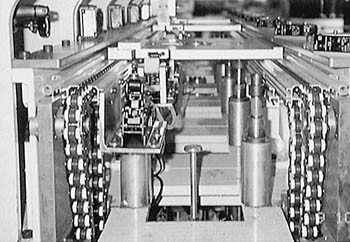 The chain is widely used in electric or electronic industries on the assembly lines, where objects (for example, VCRs) are conveyed on pallets. Usually two chains are used as a set (Figure 5.4). Pallets are usually made of aluminum with steel or plastic (polypropylene) liners at the chain-pallet contact point. Weight: 20 to 30 kg (including the weight of conveyed objects). Pallet speed: 10 to 15 m/min. DOUBLE PLUS Chain has large center rollers with small rollers on both sides. During conveyance, large center rollers and small rollers rotate at the same rpm. Chain tension, while conveying objects, is relatively low, as it is affected primarily by rolling friction. K = 1 + (large roller diameter/small roller diameter). The value of K is usually between 2.5 and 3.0. During the accumulating mode, the large rollers that support the pallet rotate in the opposite direction from the small rollers. Due to this relative motion, friction results between the two rollers, and chain tension increases. After the accumulator stop is released, the friction between large and small rollers will gradually increase the pallet speed, and eventually the pallet will resume full conveying speed (Figure 5.5). Safe design, due to only large rollers being exposed when the chain cover is installed. Low operational noise, due to low chain speed. High wear resistance, because the large and small rollers are made of engineered plastic. There are two design types of DOUBLE PLUS® Chain. These are shown in Figure 5.6. In Figure 5.6 (left), the large roller is positioned between two small rollers equipped with a step. The step portions of each small roller face each other and are inserted in the ID of the large rollers, thus holding them in position. In the right-hand illustration, the large roller is equipped with steps on both sides. The small roller is positioned over each step. Although the designs are different, the performances are practically the same. In Figure 5.6, the left-hand chain has a K speed ratio close to 3, which is slightly higher than the other type. In the design shown in Figure 5.6 (left) when the chain engages with the sprockets, the large rollers don't lock; therefore, the pallets travel at the normal conveying speed (three times the speed of chain) at the exit or entrance of the conveyor. In the right-hand illustration, the large rollers lock when the chain engages with the sprockets. Therefore, the pallet speed is reduced to the chain speed at the conveyor exit or entrance. This is convenient if you want to transfer a pallet to another conveyor moving at a slower speed. If sprockets are lowered slightly, constant conveying speed at the exit from the conveyor is maintained. The sizes of Double Plus Chain are shown in Table 5.1. 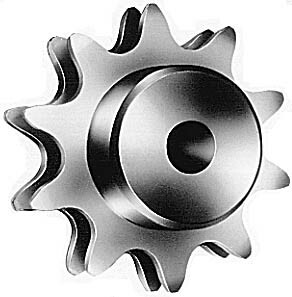 Use special 10-tooth sprockets that engage with small rollers (Figure 5.7). There are two types of DOUBLE PLUS® base chain: with or without bushings. The bearing area on the type with bushings is larger, creating a contact surface between the pin and bushing. The bearing area on the type without bushings is limited to the contact surface between the side plate and the pin. Chain with bushings has much better wear characteristics. The guide rail and bottom surface of the pallet should be smooth and straight in a DOUBLE PLUS® Chain system for proper operation. Therefore, check and compare that the chain has a flexible construction that can accommodate irregularities. Large and small rollers are available in different types of materials: standard, electroconductive, and high friction (for increased pallet acceleration). These specifications may be combined to suit your needs. Aluminum extrusions are usually available through the manufacturer. If the weight on the pallets is very heavy, or you want to extend the working life of the system, steel rails should be used. If you lubricate between the pins and bushings to reduce the noise and wear elongation, do not allow oil to get on the contacting surface of the large rollers and small rollers or on the outer surface of small rollers. If these parts are contaminated with oil, the pallets will not accelerate fast enough or they won't reach the operating speed because of roller slip. You should buy prelubricated chains. The rigidity of the chain depends on its structure. The greater the rigidity, the less likely that stick slip will occur (see Basics Section 2.3.5). If the conveyor is less than 15 m long, the possibility of stick slip is greatly reduced. There will be a gap between head and tail sprockets of two separate DOUBLE PLUS® conveyors when they are positioned in one line. Install a pallet-supporting roller in the transition area (Figure 5.8). Small objects, such as screws, may fall between exposed chain components, which can jam the system. Snap covers have been developed to prevent small objects from jamming the line (Figure 5.9). Besides chain, sprockets, and guide rails, many conveyor components, such as pallet guides (to control side-to-side motion) and brackets, have been designed for DOUBLE PLUS® Chain and guide rails. They are available as kits. Manufacturers are also expected to develop software packages to aid the conveyor designer in selecting the proper chains and components. There are DOUBLE PLUS® Chains with steel rollers for heavy loads.